Canis lupus familiaris, 1" long X 1" tall. This sculpted Paw Print Pin is expertly crafted into wearable Dog Breed art, sure to please the canine lover. 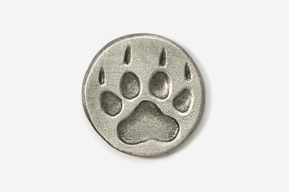 Our especially detailed pins are cast in lead-free Fine Pewter with a short nail and flat-backed clutch as shown above. All designs © GG Harris.